Brain Health Center UTD | Math-n-Science = WAHOOO! Third day of CAMT, and still going strong. The “CEO” of our bodies, the brain is continuing to grow as we age. (I can remember as a elementary kid, amazed at being told that it would stop by our pre-teen years) Ha! This talk gave us a view of the brain, and how it’s affected by learning. I enjoyed seeing pictures and learning specific parts of the brain responsible for different tasks in learning. Many depictions of the brain were drawn or photoed by three views…the sagittal, transverse (horizontal), and coronal slices or planes… Hey, there’s a little (x,y,z) coordinate graphing discussion that could go on with this…. The frontal lobe is the latest to develop and the fastest to degenerate., but the biggest development is between 5 and 25 years of age. 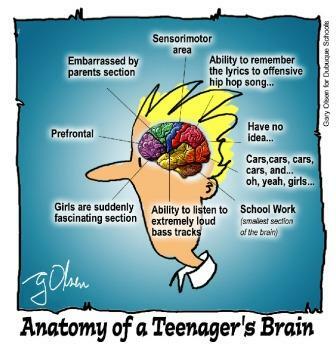 The amygdala is responsible for the emotional responses, where as the frontal lobe develops the thought process to regulate the emotions… however, in youth, it’s not developed enough… explaining lots! Myelin sheaths are the fatty connectors which help speed up the connections between the axioms and dendrites. We also have Dopa-mine pathways and Serotonin pathways affecting behaviors, emotions, etc. Fake-World Math: How Math Modeling Goes Wrong and How to Get it right. Dan started out the program with two stories, and of course grabbed our attention from the beginning… there’s that modeling the modeling process…. This is what the TEKS want us to determine for the “Problem”. What info do you or don’t you need here? Estimation Too High and Too Low… What do we need to know? So who had the closest estimation guess? Excite the kids, wandering who knows the answer? Population Education is a project of the Population Connection of Washington DC. This session demonstrated the use of numbers through hands on activities to recognize the impacts that we have on our environment. Ties to exponential growth/decay, and graphing activities were shown. A CD and packet were given and can be obtained through their website. Be sure to watch the video. A great discussion will go on as students see the effects of history, time, and population upon the world. Exploring Math with the GeoGebra App for Tablets. This session interested me. Our new TEKS for 8th grade incorporate some new topics, including rotations, associating angles with sides, similar triangles, and proportionality: (TEKS: 8b.3 8b.4 8b.5) We utilized the GoeGebra App. As with any technology, it had its up and down moments… but it was great to have a good 45 minutes just to work with the program, and find out more about it. The third day of CAMT was completed. I met some other teachers from the Allen/Plano area, as well as other parts of Texas. The enthusiasm was addictive throughout the conference. I’m very appreciative to the Allen ISD for supporting the teachers in the attendance of this conference.